The Early Childhood Development materials from age zero to three years has been launched to increase caregiver knowledge of early stimulation and to leverage frontline workers to promote and practice early stimulation techniques at the community level. The document focused on early childhood development, child development norms and sample activities, early communication, responsive care, positive parenting, playing with items around your home, playing games with our hands, and playing games with our whole bodies. The document was developed by the United States for International Development Maternal and Child Survival Programme in Ghana. Dr Joachim Gornah, the Senior Technical Specialist for Maternal and Child Survival Programme of Early Childhood Development, said the document was to guide parents to promote brain development, health and the well-being for optimal child development. He said the manual is a guide for community health workers who are part of the Community-based Health Planning Services, providing coordinated nutrition and psychosocial stimulation services. Dr Gornah said each community health workers would have a toolkit of materials such as a parental sessions guide book, flip chart with pictures, key messages, and discussion questions, a set of picture cards, wall chart on early stimulation to work with. He said early experiences and the environments in which children develop from birth to three years was important as vital brain connections are made through interactions with parents at this stage. 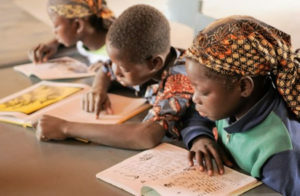 He said globally, 43 per cent of children under five years; living in low-and middle-income countries are at risk of not achieving their development potentials, adding that in Ghana, more than one quarter of children aged 36 to 59 months are behind in the domains of language, cognitive, physical and socioemotional development. “Children learn by exploring their environment, they practice new skills by playing and communicating with their caregivers. The quality and frequency of interactions with a caregiver determine the number of neural connections and brain development,” he added. Dr Gornah said besides food, a child needs stimulation to grow and develop, giving example that when a caregiver responds to a baby’s needs and signals in a sensitive and acceptable way, the caregiver is being responsive and the baby feels secure and loved. He said responsive parenting was important for a baby to build trust and feel confident to learn and explore, adding that when a caregiver sings and talks to a baby, even before the baby can talk, the baby learns to communicate back. Dr Isabella Sagoe-Moses, Deputy Director in charge of Family Health, Reproductive and Child Health, Ghana Health Service said the development of children at the early stages was necessary to ensure that children grow optimally for a brighter future. She said the GHS was committed to early childhood issues and as such developed an early childhood policies in 2004 to ensure that every child was taken through the right stages of development to develop their potentials. She said the quality of human resource must start from the early stages and that all hands must be on deck to play an effective role in the development of children. Madam Florence Ayisi Quartey, the Principal Programme Officer, Ministry of Gender and Social Protection, said the development of every child was key in the country’s sustainable development. She said early childhood development material would help stimulate children ensure that their minds develop fast and have the best start in life. Madam Quartey said the document would protect children from related abuses and ensure that the children get the needed support to survive and thrive in life.